Good leveling property and directional alignment functions for silver powder, solvent release(good compatibility with alcohol acid resin which is very difficult for dry, so it could have the function for solvent release), which could been widely used for topcoat and primer. 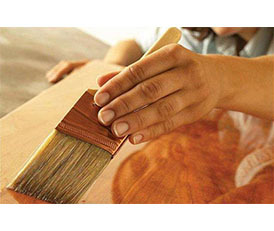 Spray the paints on wood, which could protect the furniture. MVOH: It is white powder, ketone soluble with colorless, transparent solution and it has with excellent adhesion on paper,polysulfone resin,acrylic resin,PVC,ABS,PCand the surface of ink.It has good compatibility with other film-forming material,such as alkyd resins,polyurethane elastomers,isocyanate resin, melamine resin,urea formaldehyde,epoxy polymers etc.So it is often used with other film-forming material in order to improve the coating performance,and enhance paint adhesion,flexibility, tenacity,hardness and chemical resistance.Because of the hydroxyl functional group,it can also be used for improving the characteristics including alkyd,two-component polyurethane,and two-component epoxy coatings. 9 Average Molecular Wt About 15000 Calculated by the Viscosity No. * It is NOT hazardous article, and the shelf life is six months from the production date.